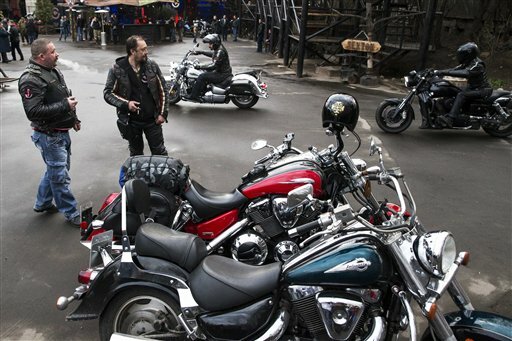 WARSAW, Poland (AP) — Polish authorities said Friday they will not allow a nationalistic Russian motorcycle group loyal to President Vladimir Putin to enter Poland, but insisted the move is not political and was made in part because Polish authorities would not be able to guarantee their security. The Night Wolves group had planned to enter Poland next week to commemorate the 70th anniversary of the end of World War II. Their plan was to cross several countries on their way to Berlin, following a path taken by the Red Army in its defeat of Adolf Hitler’s Germany. The ministry said it also received information about the group’s plans too late. The decision was relayed to the Russian Embassy in Warsaw in a diplomatic note on Friday. Ministry spokesman Marcin Wojciechowski insisted that the decision was not politically motivated. Night Wolves leader Alexander Zaldostanov, known as “The Surgeon,” told The Associated Press he was not surprised by the decision and that the group would announce its next moves on Saturday. The Night Wolves claim to be the first biker club of the Soviet Union, dating their formation to 1989. In recent years, they have attracted attention both for efforts to develop a biker culture, but also for their increasing political involvement. The club, which is estimated to have several thousand members, is strongly nationalistic and Slavo-centric, even conducting runs to Russian Orthodox holy sites. The group has close ties to President Vladimir Putin, who has been shown riding with the club, and the Night Wolves last year held an elaborate rally in Sevastopol honoring Russia’s annexation of Crimea. Tags: delay, night wolves, no motorcycle groups, Poland, provocation, Russian Embassy, Russian nationalistic, Warsaw. Bookmark the permalink.